A place for quiet contemplation, a Zen garden is a type of garden design that originated in Japan. Called a karesansui in Japanese, which means a dry garden, a Zen garden features mainly rocks and gravel. The gravel is raked to represent the natural movement of water. A Zen garden can be outdoors or indoors, and can be as small as a box sitting on a desk to be raked slowly as a stress-reliever. A Zen garden represents a natural setting on a smaller scale. Raked gravel represents ripples, waves, water in rice paddies or flow lines around rocks, which stand for islands, mountains, shrubs or animals. Lines are simple and clear, and either natural or abstract, but never formally structured. The garden should blend in with the surrounding landscape, as if it forms part of the view from the home or another vantage point. To achieve the required stillness and simplicity of design, a Zen garden should be separated from the rest of a large yard. An atrium or small yard works well as the setting for a Zen garden. Hardscaping materials play a central role in a Zen garden. The loose, raked material can be fine gravel, grit, small pebbles and crushed or decomposed granite in white, gray, beige or other neutral colors. Boulders and rocks should be weathered and carefully chosen for their pleasing forms. Patches of lichen on rocks add to the ancient, natural effect. Bridges over the gravel should be simple and natural, such as a thin slab of natural stone. Ornaments are at a minimum, and any lanterns or other accessories should be made of wood, not metal, in keeping with the pure, unrefined theme. Walking on a Zen garden disturbs the raked patterns, but paths of neutral stone are helpful to contemplate it from a variety of angles. Plants aren't necessary in a Zen garden, but if you decide to use them, they should have strong, low shapes and uniform color. They should fit in with the garden's shape and lines, and look like mature forms in miniature, as if viewed from far away. Two examples of plants suitable for a Zen garden are Bennett's compact holly (Ilex crenata "Bennett's Compacta"), which grows 3 to 4 feet tall and 4 to feet wide, and has dense, leathery, dark green foliage, and Drew's Blue Siberian carpet cypress (Microbiota decussata "Condrew") which grows 1 to 2 feet tall and 2 to 3 feet wide, and forms a mound of blue-green summer foliage that turns maroon in winter. Bennett's compact holly grows in U.S. Department of Agriculture plant hardiness zones 6 through 9, and Drew's Blue grows in USDA zones 2 through 8. Careful design is central to creating a Zen garden, but maintenance is low except for pruning. Porous landscape fabric forms the lowest layer, preventing weeds growing through and soil mixing into the gravel. 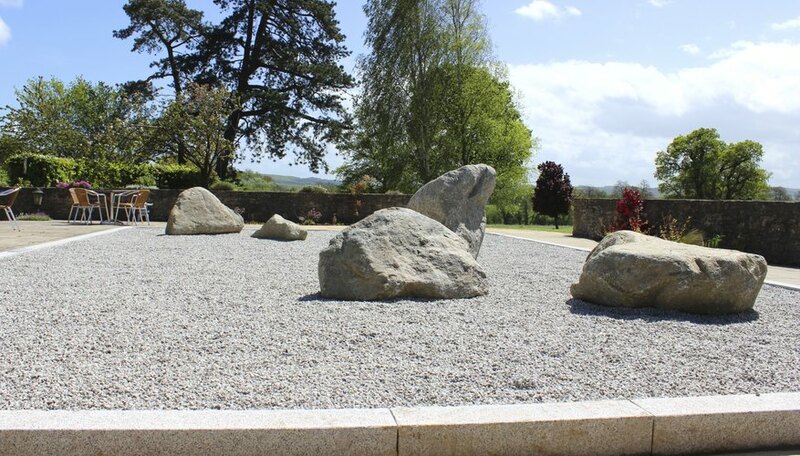 Place boulders and rocks with care and view them from all angles to check they form a pleasing and harmonious effect. Plant shrubs, small trees or other suitable plants through X-shapes cut in the landscape fabric, and spread a 2- to 4-inch layer of gravel or similar substance. After raking the gravel to create a watery effect, the only maintenance is watering and regular pruning to shape plants. Sterilize pruning shears with rubbing alcohol before and after use to prevent spreading pests and diseases.